The team flies up the spectacular Central Coast of B.C. to Calvert Island, Bella Bella, where they meet Rudy’s old friend and colleague Heiltsuk archaeologist Elroy White. 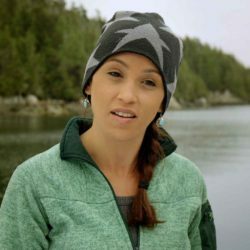 As Rudy explores one of the deepest shell middens ever discovered on the west coast, Jen and Jacob continue their friendly competition, screening for artifacts with the help of field school students who have set up a unique station on the shore of the remote island. This time it just might be Jacob’s turn to feel jealous. 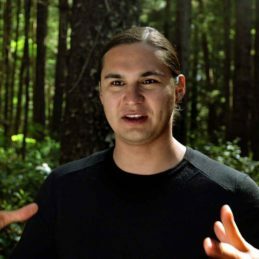 Iyohpiya, witaya Calvert Island, Bella Bella, hed wicasta wan Rudy kodakciyapi he makoce owaunspe, Elroy White, Heiltsuk etanhan witaya waecunpi. Rudy he iwanyake, tanpeska makoce hed k’e. Hed otankaye tanpeska ota yuke. Jen, Jacob kci henah ija waecunpi. Maka ataya k’epi q’a takun odepi. Wicota skanpi hed henah tukte wanji tokaha taku iyeya kte taninsni. Ihnuhnah Jacob isto nawizi kte ye. The wet climate and bounty of the Pacific Coast translate into extremely deep trenches to excavate. Ten thousand years of accumulation of rain forest soil and coastal midden deposits means that 10m trenches are common – and also uncommonly well-preserved. Abundant shells from oysters and clams provide rich calcium deposits, neutralizing the acidity of the pine needle soil and excellently preserving the evidence for us to sift through today. Wounspe tani nina takunkun ahpeyapi kin hena nina wastedakapi, qa Ikce Wicasta pi kin hena taka ahpeyapi kin hena tokedked tipi qa tokedked unpi hena osdodyapte. Farid Rahemtulla’s research focuses on the North Pacific Rim with a special interest in bone and lithic technology of Indigenous Peoples. Topical interests include complex societies, sophisticated social organization, long-distance trade and the development of large plank house villages without the existence of agriculture. Ikce Wicasta pi kin, Farid Rahemtulla isakib waziya makoce ed wayake kte iyokipi. Huhu kin hehan wiyaka he wastedake. Oyate omniciya tiwahe hena isakib owaunspe ed wayaka pi, Canbdaska Tipi Otina hena iwanyanke. Makoce maga wojupi takuda sni. So far, through all of our adventures, this is the site with the most students. Ded teca pi kin nina ota pi. Iyokipiya maka k’a pi ded he skan pi. Edward Curtis famously photographed the Kwakwaka’wakw people who lived south of Heiltsuk Territory in his 1921 book “The American Indian” . The people of the central coast fashioned great sea-faring canoes and traveled along the rim of the Pacific with sophisticated social and trading networks. One benefit of nature’s generosity meant spare energy to develop artistic culture, architecture and dramatic, powerful symbology. Edward Curtis he Kwakwaka’wakw Oyate hena ite icupi qa 1921 wowapi cage kin, “The American Indian,” hed mahed wayakapi pte. Ikce wicasta pi kin hena mini isakib titokan ba qa tipi kagapi qa takunkun ota owapi okihipi. It’s a shell midden site and quite a few things were preserved because of the shell. Tanpeska Makoce hed taku ota tanyan wayaka pi. During the Ice Age, the weight of the massive ice sheets actually caused the inland surface of the earth to sink. Like a see-saw, the outer edge of the coastal areas tilted up as much as 150-200 metres. In between there is a theoretical “hinge point,” an area that remained stable where people could live and migrate through. The region of the Hakai Passage is just such an area. Ahana, Caga tanka eceda pi kin taheka tke pi hece otankaye maka oskokpa kaga ce. De makoce kin bdaska ga, akan suta ga hece Ikce wicasta kin hed tanyanked otipi.